FC Bayern is one of the biggest clubs in world football and has a proven track record of developing world class players. The club is recognized for producing the very best players who can play at the highest levels of international soccer. As part of FC Bayern’s commitment to the US market, the club has put structures in place to coordinate the FC Bayern Player ID Program across the country. The program offers players a unique training opportunity delivered under the guidance of the experienced and professional coaching staff at GPS. The aim of the program is to identify players with the potential to become first team players capable of representing FC Bayern München at a professional level. In May 2017, Global Premier Soccer and FC Bayern renewed their unique partnership. With the objective to continue the identification of GPS players ready to train with FC Bayern Youth Teams in Munich, Germany, the two clubs agreed to continue the successful FC Bayern ID Program for boys and girls born in 2007 and 2008. 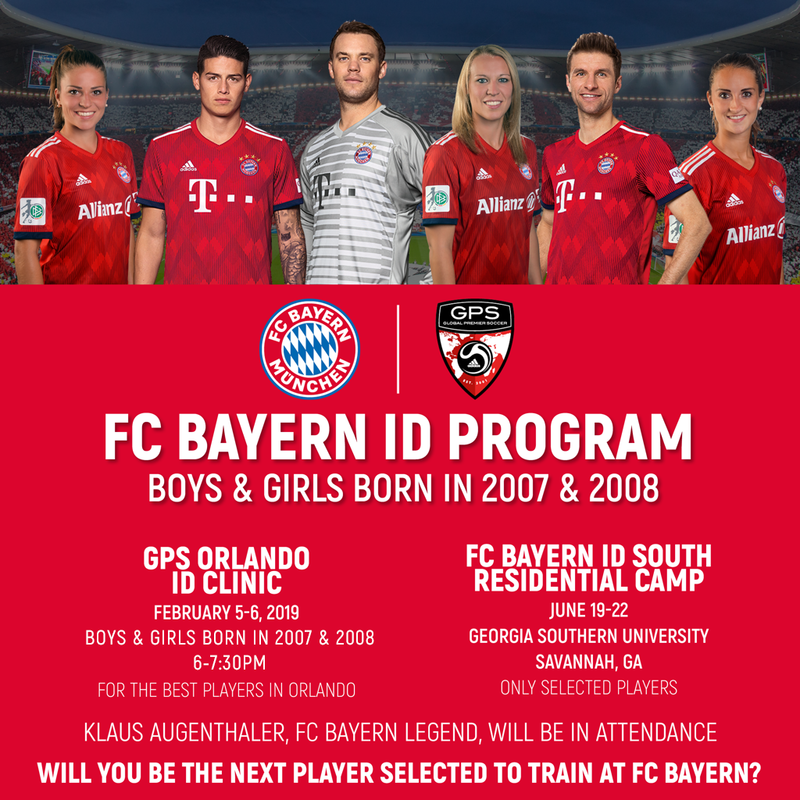 The GPS Orlando FC Bayern Regional Camp will be held at Trotters Park (2105, Lee Rd) on February 5th-6th, 2019. Players attending will be coached by GPS coaches using a training curriculum provided by FC Bayern, under the supervision of Klaus Augenthaler, FC Bayern Legend. The agenda for the clinic includes two 1.5 hour long training sessions and one webinar on the GPS Game Model and Player Roles. The webinar will be held on Monday, February 11, from 6 to 7pm. The link to partake in the webinar will be sent in the week before the event. The cost for the event is $75. Players selected from the event will go to the FC Bayern South residential camp and from there have the chance to earn a trip to Germany. Find out more via our Program Handbook. ©2019 Global Premier Soccer Florida / SportsEngine. All Rights Reserved.